When a wedding comes along it is a special time of the year. As I arrived through the ornate entrance gates, Fanhams Hall near Ware didn't fail to impress. This Grade II listed Queen Anne House-style is a true masterpiece that combines eccentricities with subtle, modern touches as well as glamour and style in a romantic setting. Fanhams Hall is noteworthy for being the birthplace and home of the first Lord Croft, Sir Henry Page-Croft, who was the youngest son of Richard Benyon Croft (benefactor of Richard Hale School) and who was Winston Churchill's appointed Under-Secretary of State for War until 1945. In 1874, Fanhams Hall was also the birthplace and home of his sister, Anne, who later became the second wife of Liverpool Brewer Sir Charles Nall-Cain; they lived at Brocket Hall, Welwyn until Lord Brocket's death in 1934, when Lady Brocket returned to Fanhams Hall where she resided until her death in 1949. It was Lady Brocket's interest in horticulture that influenced the employment of Japanese gardeners to create the Hall's formal gardens. Her ornamental lakes and choice of trees (such as Japanese maples) can still be seen in the present-day formal grounds, as can the "Fuji-yama Mound" which was built with earth from the Hall's lakes. The house was sold as a training centre to the Westminster Bank in 1951, to the Building Societies Association in 1971, and to J Sainsbury plc in February 1986. 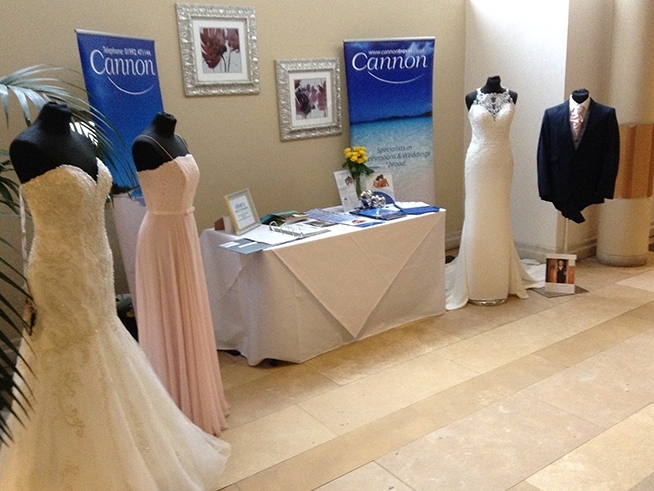 Now a hotel and established wedding venue, I was at Fanhams Hall along with our friends from Olivers Bridal & Formalwear to participate in the 2018 Wedding Fayre on Sunday January 21st. Representing Cannon Travel I chatted with many engaged couples to help and to stimulate interest and so make sure that their honeymoon travel plans were as individual, exciting and memorable as they have always dreamed. I also introduced our exciting Perfect Gift List service. Arrangements were then made for these couples to visit me on a personal basis in the Hoddesdon office for a more lengthy chat about their honeymoon travel plans along with my suggested itineraries for all budgets.